Girls are eligible to attend camp after completing kindergarten through 5th grade. Girls who have been to Camp Arequipa previously may enter the Aides in Training (ANT) program - in Sessions I, II and III only only - once they have completed 6th grade. The number of girls placed in camp is dependent on the number of adult volunteers who work at camp. Space is limited to 185 people per session. Children of full-time (5-day) volunteers are given priority placement in a session. Campers may attend only ONE session, so please prioritize your choices. ALL COMPLETE APPLICATIONS RECEIVED BEFORE February 28 WILL BE TREATED THE SAME, regardless of which day you apply — applicants will be chosen by lottery for camp placement. Only those received February 28or later will have a lower priority. (The exceptions to this are that children of full-time bus-riders, full-time volunteers, and Day Camp Committee volunteers always receive priority placement.) 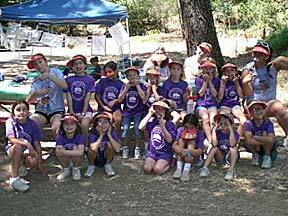 Marin County Day Camp Committee does not assume responsibility for any late, lost or misdirected mail. » Find out about the Aides-in-Training (ANT) program, which will be held during Sessions I, II and III only in 2019. – Cookie Credits CAN be applied to Day Camp fees. – If the camper is not already a registered Girl Scout, there is an additional $40 fee. This fee, which is not refundable, includes both the $25 Girl Scout membership fee and a $15 Council service fee. – Full-time (5-day) and part-time (3-day) volunteers receive credits toward camp fees. Girls who do not get into camp in our lottery will be put on a waiting list. Campers will be notified if space becomes available. If space becomes available, any balance is due within TWO WEEKS of notification, or within three weeks of the start of camp, whichever is sooner. Camp fees are not refundable within three weeks of the start of the camp session. Bus stops will tentatively be Mill Valley-Greenbrae-San Anselmo on one bus and Terra Linda-Central San Rafael-Fairfax on a second bus. First stops leave between 8-8:30am; locations subject to change dependent upon needs. Please note that there is no bus service from West Marin. For each session we need two week-long adult volunteer Bus Riders who will ride to and from camp each day, one on each route.